Take a Free or REAL Money ✅ Spin on the Red Mansions IGT Slot App. 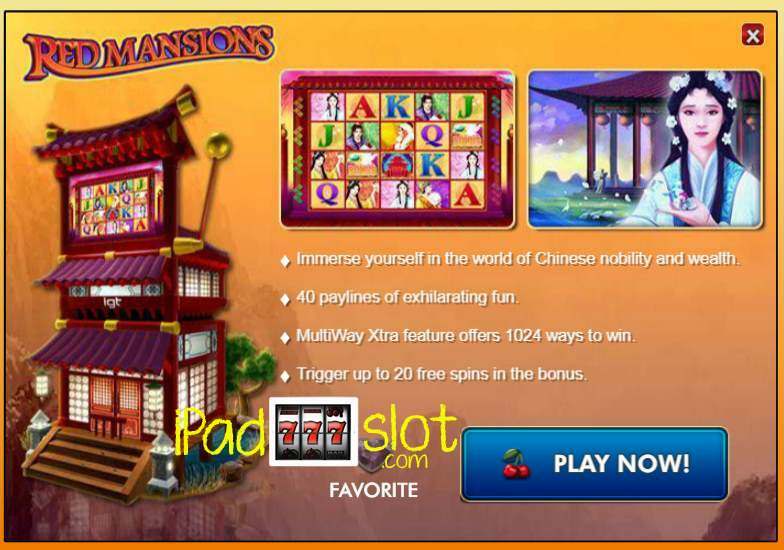 Red Mansions is an Asian themed slot game from the IGT company. 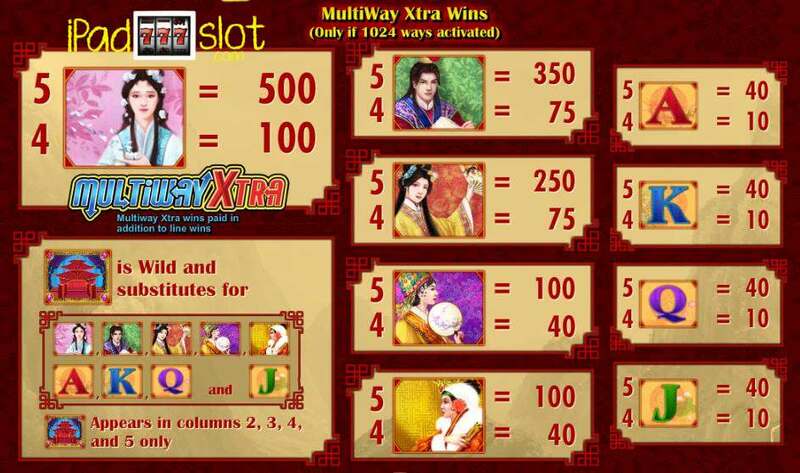 In this pokies game, players are taken on a virtual trip to the East where they get to view Asian women and men in traditional dress, while at the same time, players also get to learn more about the Asian culture including the history behind pagodas and other Orient bits n’ bobs..
For more about this game, players need to continue reading this review below. 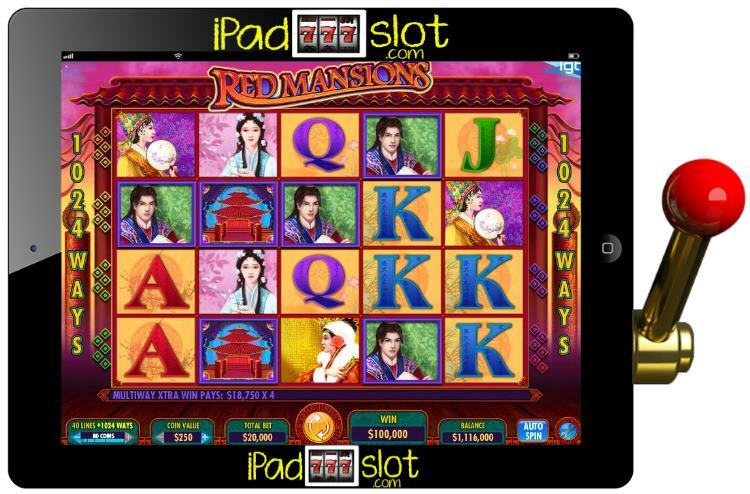 Just remember that Red Mansions slot game app comes with five reels and an incredible 1024 ways to win some big prizes. The background of this slot game depicts a beautiful undulating Asian mountain landscape. The reel section is beautified by a red wall so the colours are true to it’s theme. When spinning the reels of Red Mansions, players will find the following symbols on the reels: Asian lady in white, Asian man, Asian lady in yellow, Asian lady holding an orb, Asian lady in white and red, and traditional poker symbols. Asian lady in white: The highest paying symbol in this game is the Asian lady in white. For matching five of these the player wins 1,250,000 coins, for matching four of these the player wins 700,000 coins and for matching three of these the player wins 31,250 coins. Asian man: The second highest paying symbol is the Asian man. For matching five of these the player wins 500,000 coins, for matching four of these the player wins 125,000 coins and for matching three of these the player wins 25,000 coins. Asian lady in yellow: The third highest paying symbol is the Asian lady in yellow. For matching five of these the player wins 250,000 coins, for matching four of these the player wins 100,000 coins and for matching three of these the player wins 18,750 coins. Asian lady holding an orb and Asian lady in white and red: The fourth highest paying symbols are the Asian lady holding an orb and Asian lady in white and red. For matching five of a kind the player wins 125,000 coins, for matching four of a kind the player wins 25,000 coins and for matching three of a kind the player wins 12,500 coins. Traditional Poker Symbols: These icons pay the lowest in the game. For matching five of a kind the player wins up to 75,000 coins, for matching four of a kind the player wins up to 18,750 coins and for matching three of a kind the player wins up to 3,750 coins. Wild: The wild symbol is represented by the pagoda. Scatter: The scatter is represented by the icon written BONUS. This feature is triggered when the player lands at least two scatter symbols. 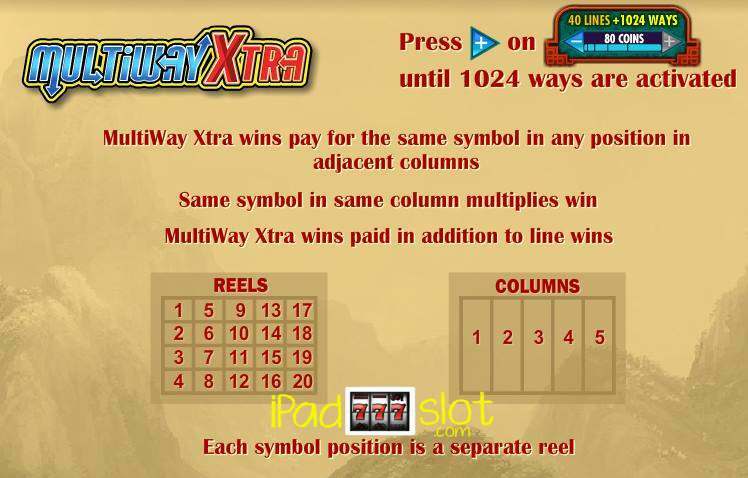 For two scatter symbols the player wins 10 free spins. 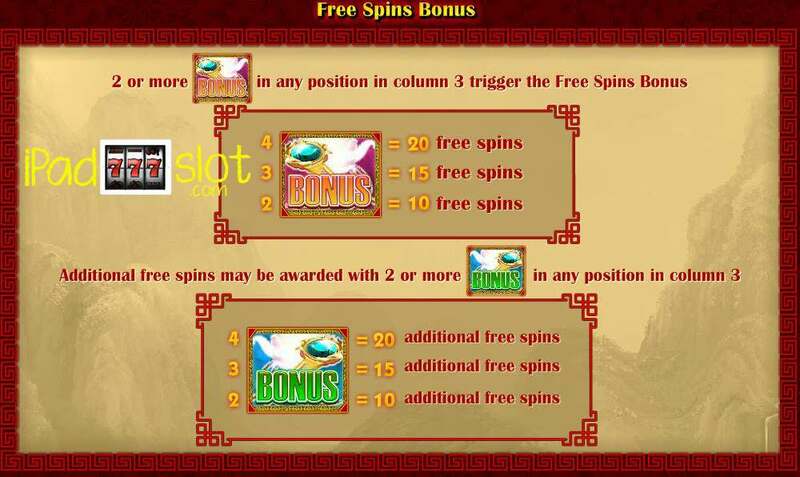 For three scatters the player wins 15 free spins. 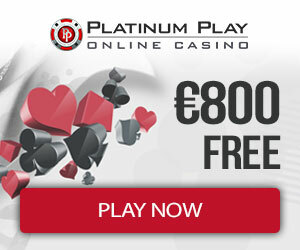 For five scatters the player wins 20 free spins. Red Mansions is an entertaining slot game app to play which is pretty easy to understand, also the bonuses are just super in every way. Depending on the version The RTP of this slot range from 92.9 percent to 96.37 percent. 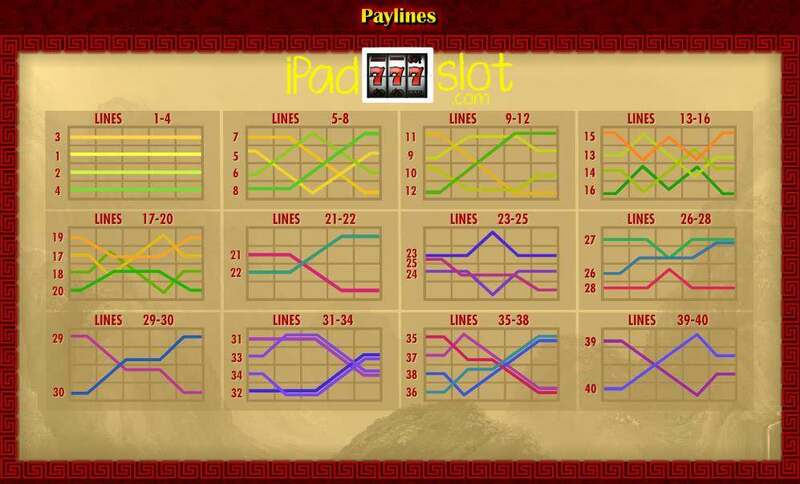 Out of a 10 point rating, this game gets an 8.5 point rating and it’s one of the best Asian themed online slots to play.